One of my favorite salads to order at any Asian restaurant – the classic Asian chicken salad. But have you ever checked the calorie count on those restaurant dishes?! Many of those salads have more calories than a burger! This healthier take on the classic salad is made with chicken breast and a homemade soy-sesame seed glaze! It’s also full of crunchy ingredients like Romaine lettuce, red cabbage and crispy chow mien noodles! For the salad base, I love to create a combination of flavors and textures. I add romaine lettuce, finely chopped red cabbage, shredded carrots and even a bit of cilantro to add a refreshing twist. The chicken preparation is super easy! I make a home-made teriyaki glaze, which is perfect for this salad. Just brown the chicken, then pour over the sauce and let it simmer away. This chicken recipe is so simple and delicious! 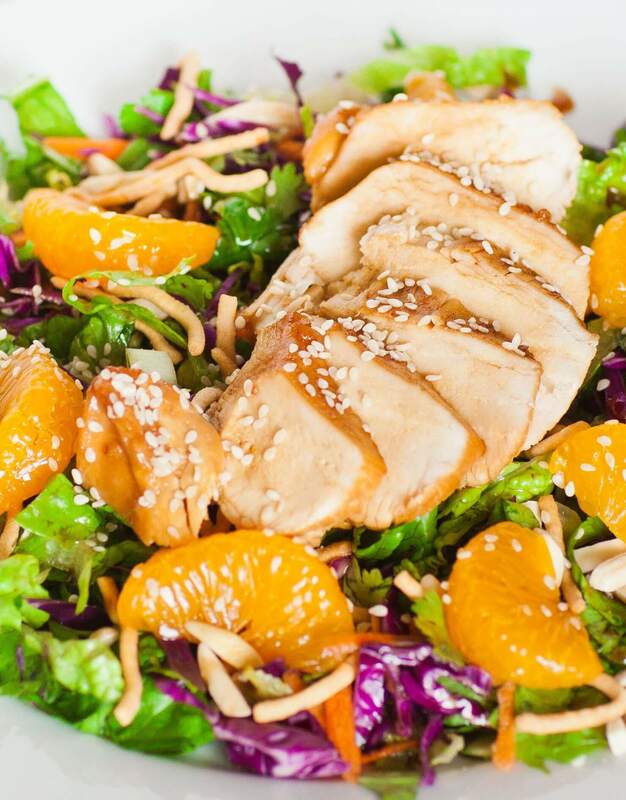 And no Asian chicken salad would be complete without a healthy helping of mandarins! I love to load up my salad with these sweet citrus segments; they add so much flavor to the salad! And to add some crunch, a few crunchy noodles and nuts to add the finishing touch. I love that this salad is so easy to make and it tastes incredible! Nothing like enjoying restaurant classics from the comfort of home! Preheat oven to 400F. In a small saucepan, combine all ingredients for glaze. Bring to a simmer over medium-low heat. Cook for about 15 minutes until glaze is reduced in half. Preheat a medium fry pan over medium heat. Add a splash of olive oil and brown chicken on all sides. Pour in half of the prepared glaze. Place pan into the oven to finish cooking the chicken. Turn the meat frequently to ensure even cooking and seasoning. If glaze reduces too quickly in the oven, add a small amount of water. Bake for 15-18 minutes or until internal temperature reaches 165F. Meanwhile, toss together all the remaining salad ingredients in a large bowl; add chow mien and almonds to your liking. When chicken is ready, slice it into thin pieces, top salad and dress with prepared glaze. Garnish with sesame seeds if desired. Serve salad while chicken is warm! Tatyana thank you for your videos. I enjoy watching them. Quick question: why shouldnt i put nonstick pans into a dishwasher? Is it referring to all the nonstick pans or just this one?